Welcome to Homewood Suites by Hilton Ankeny. Enjoy a convenient location in a dynamic business park just off of I-35 and only minutes from downtown Des Moines Iowa. Visit popular Iowa attractions including Adventureland Amusement Park the Prairie Meadows Racetrack and Casino and the Iowa State Fair easily reached from our all-suite Ankeny IA hotel. Feel at home in a comfortable studio or one-bedroom suite. Prepare meals in the fully equipped kitchen which features a dishwasher microwave twin burner cooktop coffeemaker and a range of utensils. Take advantage of our complimentary grocery shopping service and let us stock your suite with all your favorite foods. Buy snacks chilled meals beer wine and essentials at the 24-hour Suite Shop. 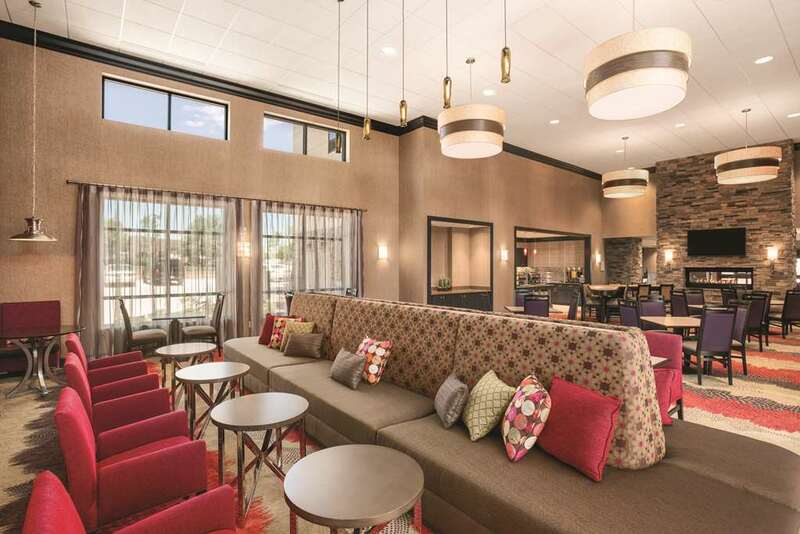 Every suite at this extended-stay hotel in Ankeny Iowa features separate living and sleeping areas a 37-inch HDTV and complimentary WiFi. Join us for a complimentary full hot breakfast served every morning at our all-suite hotel in Ankeny Iowa. After a busy day of business or leisure enjoy complimentary evening dinner and drinks* Monday through Thursday. It*s easy to exercise with our indoor swimming pool and complimentary fitness center which features contemporary cardio and weights equipment. Visit the complimentary 24-hour business center to put last minute touches to your presentation. Host a conference for up to 40 guests in our 525 sq.ft. meeting room and take advantage of the latest A/V technology. Let our experienced staff help plan the details ensuring your event is a success. *State and local laws apply.